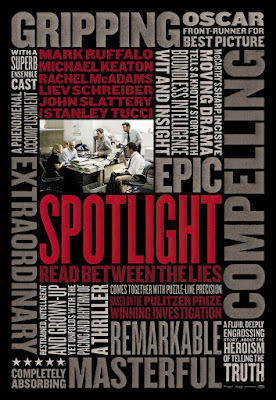 Spotlight is now showing in Australian cinemas and is distributed by eOne. 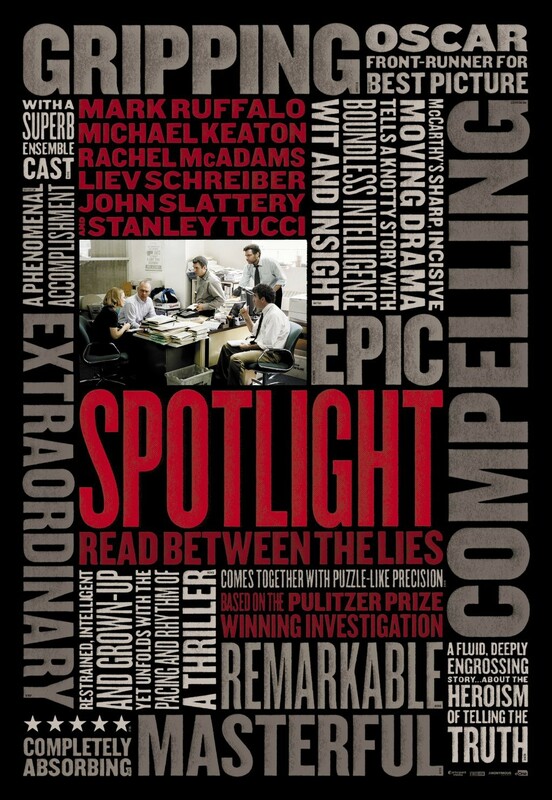 Absolutely engrossing and the stunning example of story driven tension, Spotlight is a superb film with an incredible screenplay that brings to light terrible issues while not actually telling a story about them. In 2001, members of The Boston Globe's Spotlight team were given the assignment of looking into allegations of child molestation by Catholic priests within the city and determining whether there was any evidence of a pattern among them. What they discovered over the year that they spent investigating and speaking to the victims was sufficient evidence of a cover up within the church on a much greater scale than they or anybody else could have ever imagined. Spotlight is ultimately not a film about the actions of the Catholic Church and it's priests, although it will no doubt stimulate thought and conversation about the subject. It is a film about the journalists who were part of the Spotlight team and how they came to expose the cover up. So at it's core, Spotlight is essentially about investigative journalism and how it has the power to increase knowledge and awareness and bring about change. Tom McCarthy's film is in the same class as All The Presidents Men, the 1976 film about the reporters who uncovered the Watergate scandal. Like All The Presidents Men, Spotlight will become a film for all journalists and journalism students to watch as it is not only an example of extremely good investigative reporting, but it is also what all journalists strive for, which is to put the pieces together and uncover something that nobody else has. Of course All The Presidents Men and Spotlight are extreme and very rare examples of what journalists can achieve, yet they remain inspiring for those who are in the profession. The power of investigative journalism is at the heart of Spotlight, but again the actions of the Catholic Church are brought to light in the process. It is impossible not to be moved by the revelations that the Spotlight team make over the course of their investigation, but the wonderful thing is that it is not the witnessing of these atrocious acts that bring about emotion. It is all in the dialogue spoken by those who uncover the shocking information and by the victims telling their stories. There are no confronting visuals of the actual acts of molestation in the film. This may be comforting to some, but the truth is that the imagination can conjure up mental images that are just as frightening. This is what makes Spotlight such a brilliant piece of work. It is not a film with a great deal of action, but it is it's story and dialogue that are so powerful that they create emotion, tension and suspense by themselves. The outcome of the investigation is inevitable, yet there is still a build up with a sense of heightened tension leading towards the conclusion. While the film's strength lies in it's screenplay, it's visuals help support the story and say the things which aren't being verbalised. The investigation by the Spotlight team takes place over the course of a year and this time period is shown with the cinematography involving the changing of seasons. Visually, the film is very neat and refined. One particularly special moment of the film is at Christmas time, when all the main characters are shown in a montage that expresses how they are feeling accompanied by the sounds of children singing a Christmas carol. It is a rather haunting moment. Spotlight is essentially about the team of journalists who uncovered something truly incredible and were awarded the Pulitzer Prize for their work. However, the film does not glorify the individuals or make them out to be heroes. They were just people going to work each day and doing their jobs. Despite this, the cast of Spotlight all give strong and memorable performances. Mark Ruffalo gives the most passionate performance as Mike Rezendes. His character's commitment demonstrates how the deeper into the investigation he got, the harder it was to not get emotionally involved. Michael Keaton stars as the head of Spotlight, Walter Robinson and gives a strong performance, but it is not one that requires much emotion or variation. As Sacha Pfeiffer, Rachel McAdams gives the best performance of her career thus far. Her character develops the most throughout the film as she is the one who had the greatest connection to the church beforehand and her internal struggle while she sympathizes with the victims is rather moving. Stanley Tucci gives a very interesting performance as Mitchell Garabedian and although he is rather hostile, is intriguing to watch and has a great deal of character. Spotlight demonstrates not only the power of investigative reporting when all the pieces come together, but how suspense and emotion can be achieved by superb storytelling and direction.